This is a guest post by Mary Galvin, founder and managing principal at AIC. Mary provides technical consulting services to clients including LexisNexis’ HPCC Systems team. The HPCC is an open source, massive parallel-processing computing platform that solves Big Data problems. Data Science DC hosted a packed house at the Artisphere on Monday evening, thanks to the efforts of organizers Harlan Harris, Sean Gonzalez, and several others who helped plan and coordinate the event. Michael Burke, Jr, Arlington County Business Development Manager, provided opening remarks and emphasized Arlington’s commitment to serving local innovators and entrepreneurs. Michael subsequently introduced Sanju Bansal, a former MicroStrategy founder and executive who presently serves as the CEO of an emerging, Arlington-based start-up, Hunch Analytics. Sanju energized the audience by providing concrete examples of data science’s applicability to business; this no better illustrated than by the $930 million acquisition of Climate Corps. roughly 6 months ago. Michael, Sanju, and the rest of the Data Science DC team helped set the stage for a phenomenal presentation put on by John Kaufhold, Managing Partner and Data Scientist at Deep Learning Analytics. John started his presentation by asking the audience for a show of hands on two items: 1) whether anyone was familiar with deep learning, and 2) of those who said yes to #1, whether they could explain what deep learning meant to a fellow data scientist. Of the roughly 240 attendees present, the majority of hands that answered favorably to question #1 dropped significantly upon John’s prompting of question #2. Machine learning’s dirty work: labelling and feature engineering. John introduced his topic by using examples from image and speech recognition to illustrate two mandatory (and often less-than-desirable) undertakings in machine learning: labelling and feature engineering. In the case specific to image recognition, say you wanted to determine whether a photo, ‘x’, contained an image of a cat, ‘y’ (i.e., p(y|x)). This would typically involve taking a sizable database of images and manually labelling which subset of those images were cats. The human-labeled images would then serve as a body of knowledge upon which features representative of those cats would be generated, as required by the feature engineering step in the machine learning process. John emphasized the laborious, expensive, and mundane nature of feature engineering, using his own experiences in medical imaging to prove his point. Above said, various machine learning algorithms could use the fruits of the labelling and feature engineering labors to discern a cat within any photo – not just those cats previously observed by the system. Although there’s no getting around machine learning’s dirty work to achieve these results, the emergence of deep learning has helped to lesson it. Machine Learning’s ‘Deep’ Bench. I entered John’s presentation knowing a handful of machine learning algorithms but left realizing my knowledge had barely scratched the surface. Cornell University’s machine learning benchmarking tests can serve as a good reference point for determining which algorithm to use, provided the results are taken into account with the wider, ‘No Free Lunch Theorem’ consideration that even the ‘best’ algorithm has the potential to perform poorly on a subclass of problems. Provided machine learning’s ‘deep’ bench, the neural network might have been easy to overlook just 10 years ago. Not only did it place 10th in Cornell’s 2004 benchmarking test, but John enlightened us to its fair share of limitations: inability to learn p(x), inefficiencies with layers greater than 3, overfitting, and relatively slow performance. The Restricted Boltzmann Machine’s (RBM’s) revival of the neural network. The year 2006 witnessed a breakthrough in machine learning, thanks to the efforts of an academic triumvirate consisting of Geoff Hinton, Yann LeCun, and Yoshua Bengio. I’m not going to even pretend like I understand the details, but will just say that their application of the Restricted Boltzmann Machine (RBM) to neural networks has played a major role in eradicating the neural network’s limitations outlined in #2 above. Take, for example, ‘inability to learn p(x)’. Going back to the cat example in #1, what this essentially states is that before the triumvirate’s discovery, the neural net was incapable of using an existing set of cat images to draw a new image of a cat. Figuratively speaking, not only can neural nets now draw cats, but they can do so with impressive time metrics thanks to the emergence of the GPU. Stanford, for example, was able to process 14 terabytes of images in just 3 hours through overlaying deep learning algorithms on top of a GPU-centric computer architecture. What’s even better? The fact that many implementations of the deep learning algorithm are openly available under the BSD licensing agreement. Deep learning’s astonishing results. Deep learning has experienced an explosive amount of success in a relatively small amount of time. Not only have several international image recognition contests been recently won by those who used deep learning, but technology powerhouses such as Google, Facebook, and Netflix are investing heavily in the algorithm’s adoption. For example, deep learning triumvirate member Geoff Hinton was hired by Google in 2013 to help the company make sense of their massive amounts of data and to optimize existing products that use machine learning techniques. Fellow deep learning triumvirate member Yann LeCun was hired by Facebook, also in 2013, to help integrate deep learning technologies into the company’s IT systems. As for all the hype surrounding deep learning, John concluded his presentation by suggesting ‘cautious optimism in results, without reckless assertions about the future’. Although it would be careless to claim that deep learning has cured disease, for example, one thing most certainly is for sure: deep learning has inspired deep thinking throughout the DC metropolitan area. 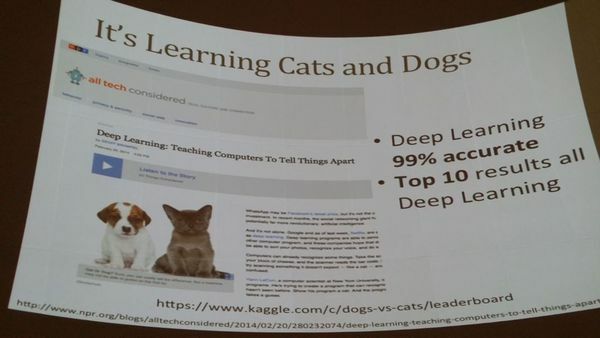 As to where deep learning has left our furry feline friends, the attached YouTube video will further explain…. You can see John Kaufhold's slides from this event here.